This is the executive summary of a report that was prepared for City of London-based client in 2001. The analysis has proven prescient, and in the light of events in mid-2008, they have agreed to release the executive summary for general view. Figures have been inserted or updated to reflect recent events. This paper has been written in response fears that the recent (1996-2001) Internet bubble is a symptom rather than a resolution of organic instability in financial markets. 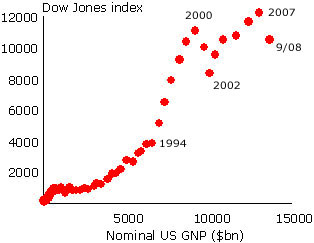 The figure shows the Dow Jones, plotted against nominal US GDP since 1929. Asset price inflation in the 1990s is clear, and the resulting instabilities are self-evident. This report considers the dynamics of this system with a view to assessing whether this is intrinsic to the dynamic structure of the financial industry or a phase, perhaps relating to global integration. Second, we assess the nature of the three stakeholders in the financial industry: its owners, its employees and its customers. (Because the word 'customer' has become over-stretched, we use the term 'social product' to describe all of the things which industries such as financial services deliver as a primary product of their activity. Public sector activities such as prison staff hardly have customers, save indirectly, but their deliverables - such as healthy, safe and contained prisoners - constitute their social product. The social product of a car manufacturer is to supply vehicles that meet or exceed the offer of its competition.) It is clear that much that financial institutions undertake is not aimed at even a broad definition of their social product, but rather at zero-sum games played internally to the industry. Third, we consider the nature of the motivation that guides the actions that are taken within this system by the three stakeholders. We find that these are neither aligned nor structured to generate the negative feedback that is necessary for stability. We find two issues that are of great importance to the future stability of this industry. As a basic and initial point, the social product of the industry - the needs of its customers - have become far less important to it that are the motives of its shareholders and employees. Indeed, there are many examples when it sets out actively to bamboozle its clients with complex products and obfuscation, and indeed succeeds in achieving the same affect amongst its senior management, accounting and compliance staff. Our interviews found many senior staff hoping rather than knowing that their juniors were behaving as they would wish. As a consequent point, the connection between the motivation (strategic, psychic and financial) of the middle ranking staff in the industry has become divorced from the social product, and connected to zero sum trading within the industry, to the pursuit of scale for its own sake and as a consequence of the resulting predatory environment, towards managing the share price and the published data that contribute thereto. Interviews frequently reported that senior staff felt that accounting was increasingly divorced from reality, and that few if any in their organisation knew the current state of play. The concept of 'shareholder value' acquired a dominant position amongst business economists during the 1990s. It holds that if a firm sets out to deliver optimal value to its shareholders, it will automatically generate excellent products, position itself to maintain long-term competitiveness and to innovate appropriately. However, whilst this should be true, its outcome depends very largely on the pressures which the shareholder - or more specifically, the agents who act on behalf of the shareholder - impose on the firm. In particular, its fulfilment requires these agents to assess the firm in the round, taking into account its potential, its intangible assets, the quality of its management and other items that it is difficult to report and impossible to quantify in an unambiguous manner. It requires small firms - in which the bulk of US and EU book capital resides - to be treated in the same way as the very large. It requires managers to react to pressures for greater returns by increasing their productivity - a lengthy, costly and often initially intangible process - rather than by cost cutting or borrowing money in order to pay dividends, undertake acquisitions of dubious merit or the other responses that have so characterised the last decade. This is not what has happened. Market agents discount potential in favour of cash in hand. The pressure on firms is to decrease their capital base, increase their pay out and focus on their 'core', a dubious concept in that today's core is certainly not tomorrow's without investment in the very intangibls which markets appear to deprecate. Indeed, we see many firms that have essentially thrown away their brains and their futures in attempt to cut costs to a minimum, not least because markets appear not to value such potential, and a huge increase in corporate debt. Interviewees attribute this affect entirely to market pressures for immediate dividends, the antithesis of what 'shareholder value' should imply. It follows that the actions of the shareholders' agents do not themselves reflect shareholder value. The same may be true within the murky reporting systems which banks and others themselves use to report their status: if senior staff do not know the extent of their liabilities, as many report, them how can public accounting accurately reflect these? We see, therefore, that the social product due from the financial industry is not supported by the motivation of those engaged in the industry. Firms are pressed in directions which are not natural to them. Financial organisations are engaged in zero sum games over immense sums of money for reasons which, once again, have very little to do with either their social procuct or, very probably, their own generation of shareholder value. We began by indicating that a stable system was one which was dominated by negative feedback, and one in which information was used to inform a clear model of what generated long-term success. What we observe is the converse. Further, these conditions are, if anything, intensifying as ever-more esoteric products are created and traded. At the same time, the nature of traded assets is probably decreasing as a proportion of the total capital employed in the economy. The time scale in which trading (and, supposedly, reporting) occurs is far shorter than the innate cycle time of the meaningful information that is associated with the assets which are being traded. The gap is being plugged by "fake" information in respect of categories of investment: telecommunications companies, Asian companies, Internet firms are all deemed to have acquired some generic magic, traded up and dropped when the glamour fades. Similar things may happen around the Chinese economy and its feedstocks - minerals and energy - if its current growth continues. All of these actions are being taken with increasing volume and speed, but with decreasing transparency and apparent accountability within organisations. Senior managers report that they find it hard to understand and harder yet to accept the validity of some of the exceedingly technical derivatives that are supposed to parcel risk and price this; yet they see no alternative to accepting these new developments because to be seen to be old fashioned is riskier still. Trillions of dollars of liability appear to be entailed in these vehicles. Our assessment is that the volatility of this environment is likely to increase sharply. Naturally, this will lead to abrupt realignments, to friction and to loss. More to the point, we note that the internal focus of many financial institutions means that they are failing to deliver their social product. There appears to be a "surplus of saving" - asset price inflation - yet entrepreneurs find it virtually impossible to gain early-stage venture funding. Consumer debt is mounting to levels which can only be called irresponsible, yet small businesses find borrowing extremely difficult. There are arguments to be made that at least some aspects of the financial sector has lost its way. Why, however, have entrepreneurs not come forward with more relevant products? Interviewees suggested that current wage levels made 'microfinance' products unachievable, and that current regulatory structures favoured current practice. Indeed, however these gains have been made, it is unarguable that banks have reported enormous profits and that huge sums have been extracted from the industry. Some interviewees suggested that this consisted largely of 'borrowing from the future' and that corresponding liabilities were accreting - somewhere - in the system. Many expressed concern as to where their 'somewhere' might be. If this is an accurate representation of the system, then it may take a major event to force a reconsideration of the role of the financial in the economic ecology. Its social product should be clear: to manage savings for a good balance of risk and return and, in harmony with this, to allocate these funds where they will yield an equally satisfactory balance of risk and return; to move resources around the world and to assist large clients to raise capital; to allow clients to manage their current and prospective risk in a variety of time frames. The challenge of the knowledge economy is how this is to be done in respect of intangible assets - such as ideas, technical potential and the like - and to do so in a far looser web of commercial alliance than was hitherto commonplace. To achieve this may be a feat of design rather than the consequences of evolution, but who the designer is to be - or how they are to gain permission to act - is far from clear. There is an enormous literature on the economic and social underpinnings of market bubbles. One perspective which matches the ideas in this report is the following. The figure contrasts two important dimensions that influence stability: the alacrity with which data are interpreted, and the structural consequences of the motivation of the individual agents who act upon them. 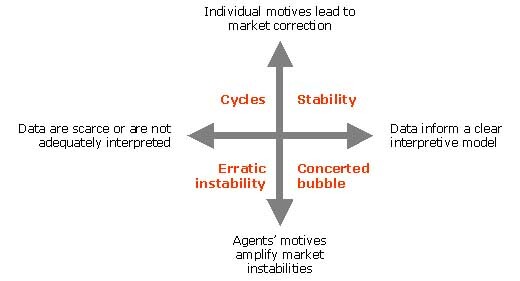 Only one quadrant leads to stability: that in which data are used in a clear and well-calibrated 'thinking model', and in which individual profit seeking drives markets towards stability, in the manner of the 'invisible hand'. When the invisible hand fumbles in darkness, cycles of over- and under-capacity are often observed: in agricultural production, oil refinery capacity and insurance, for example. The lower quadrants reflect environments in which agents act in systems in which individual actions tend to increase instability, typical of systems under positive feedback or where the coupling between the elements of the system - here, traders and the performance of the assets which they trade - weakly reflect each others' dynamics and response times. Where there is no prevailing model, erratic instability results. Where there is a dominant perspective, we see herd behaviour and the denial of counter-information, the grounds for a classical bubble.